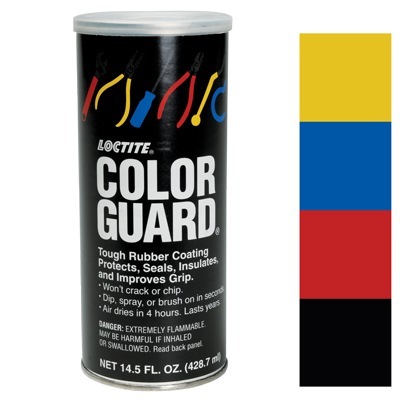 Loctite ® Color Guard ®, a solvent-based, modified thermoplastic liquid coating that dries to a durable, flexible, rubber-like protective coating on parts and equipment. Dip, spray or brush to apply. Great for tools, metals, electrical connections, masonry, wood, conveyors, glass, rope, and fabric. Meets ASTM E-96 moisture resistance, ASTM Bâ€“117 salt spray testing, ASTMG-53-84 accelerated 10 year weather test, and CFIA.